Frederick Spider builds a beautiful spiderweb inside a lady’s house. The lady does not like that very much. She carefully picks up Frederick and puts him outside. What should he do now? ✓The illustrations are colorful and they stimulate the imagination. ✓ The pages are easy to turn with a swipe gesture (swipe from right to left). ✓ Children can listen to the story, look at the pictures and read along. ✓ Each page contains amusing animations. We published our book Frederick Spin for toddlers and young children in 2011. My husband illustrated the book, having had a lot of experience in illustration and design and I was the author having had years of experience teaching children aged 2-6yrs. We had an overwhelming response to the book as it taught children about friendship, looking after one another, but also about fear. Teachers were using it to teach children how to cross the street. It was after this success, we decided to take the next step. In May this year we released our book app Frederick Spider in Dutch and English. Because Frederick Spider is a ‘real’ reading story, we opted not use interactivity, as we felt that it would only distract the children, but each page does have some amusing animations. Who helped you develop this app? Henk, my husband and I made this App together. Henk did the animations and programming process and I did the narration in Dutch and background noises/music. We have translated the text into English, and found a great narrator in America – Jerry E. Reed who did a wonderful job for us. Which page have you found children liked the most? I think children like the page where the cars drive past the most. 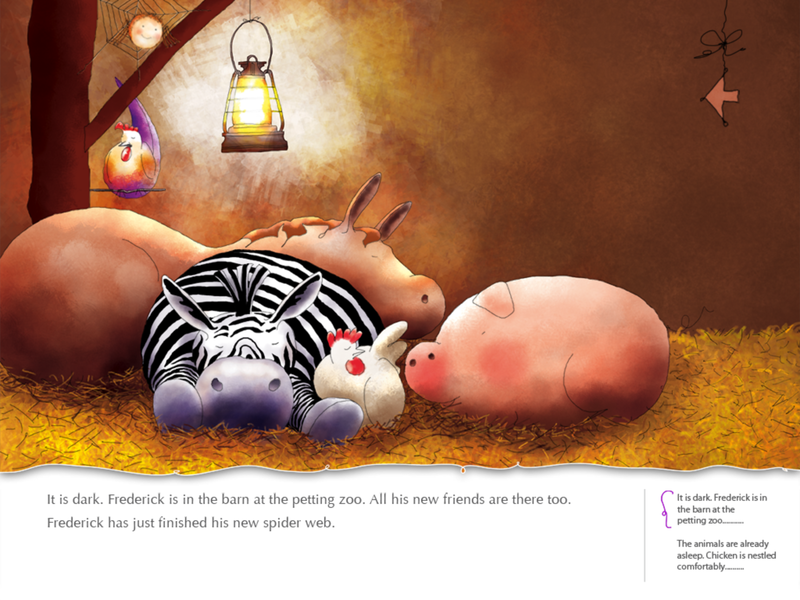 My favourite page is the last page where all the animals are sleeping and Frederick feels so happy, it’s such a cute illustration. This picture book is about friendship and looking after one another, but it is also a book that talks about fear. I hope this book app can help children to talk about these issues with their parents, so they can learn, and as I said before you can use the book to teach children about crossing the street. Research has shown that it is always very good for children to be exposed to language, books, reading at a young age. This app is suitable for toddlers and young children. But older children like it too because they can read along by using the user-friendly text function. Not a Frederick Spider update, but we are working on a new app. Soon I will tell you more about it. This is such a delightful book, just beautiful.